Should the internal energy of a system necessarily increase if heat is added to it? ∆T = Change in temperature. ∆U = 0, i.e. in isothermal processes, where temperature remains constant, the internal energy doesn’t change even on adding heat to the system. Thus, the internal energy of a system should not necessarily increase if heat is added to it. Should the internal energy of a system necessarily increase if its temperature is increased? Internal energy of a system increases if its temperature increases. This is valid only for the system of ideal gases and not for all the systems. For example: During meting process, temperature of the system remains constant, but internal energy change increases by mL. A cylinder containing a gas is lifted from the first floor to the second floor. What is the amount of work done on the gas? What is the amount of work done by the gas? Is the internal energy of the gas increased? Is the temperature of the gas increased? As a cylinder is lifted from the first floor to the second floor, there is decrease in the atmospheric pressure on the gas and it expands. Therefore, some work is done by the gas on its surroundings. Work done on the gas is zero. The increase in the internal energy and temperature of the system will depend on the types of the walls of the system (conducting or insulating). A force F is applied on a block of mass M. The block is displaced through a distance d in the direction of the force. What is the work done by the force on the block? Does the internal energy change because of this work? This work done does not change the internal energy of the block as the internal energy does not include the energy due to motion or location of the system as a whole. The outer surface of a cylinder containing a gas is rubbed vigorously by a polishing machine. The cylinder and its gas become warm. Is the energy transferred to the gas heat or work? As the outer surface of a cylinder containing a gas is rubbed vigorously by a polishing machine, no work is done on the cylinder. Volume of the gas remains constant and the heat energy generated due to friction between the machine and the cylinder gets transferred to the gas as heat energy. This heat energy leads to an increase in the temperature of the cylinder and its gas. When we rub our hands they become warm. Have we supplied heat to the hands? When we rub our hands, they become warm. In this process, heat is supplied to the hands due to the friction between the hands. A closed bottle contains some liquid. the bottle is shaken vigorously for 5 minutes. It is found that the temperature of the liquid is increased. Is heat transferred to the liquid? Is work done on the liquid? Neglect expansion on heating. A closed bottle containing some liquid is shaken vigorously such that work is done on the bottle (against the viscous force). Hence, the temperature of the liquid increases. However, no external heat is supplied to the system. The final volume of a system is equal to the initial volume in a certain process. Is the work done by the system necessarily zero? Is it necessarily nonzero? Work done by the system is neither necessarily zero nor necessarily non-zero. Hence, it is an isobaric process. Even if P = P(V), net work done will be zero if V2 = V1. In this case, work done is zero. If the system goes through a cyclic process, then initial volume gets equal to the final volume after one cycle. But work done by the gas is non-zero. Can work be done by a system without changing its volume? If the system goes through a cyclic process, then initial volume gets equal to the final volume after one cycle. But work done by the gas is non-zero. So, work can be done by a system without changing its volume. An ideal gas is pumped into a rigid container having diathermic walls so that the temperature remains constant. In a certain time interval, the pressure in the container is doubled. Is the internal energy of the contents of the container also doubled in the interval ? Thus, internal energy, U = nCvT will double as the number of moles get doubled. When a tyre bursts, the air coming out is cooler than the surrounding air. Explain. When a tyre bursts, adiabatic expansion of air takes place. The pressure inside the tyre is greater than the atmospheric pressure of the surrounding due to which the expansion of air occurs with some work done against the surrounding leading to decrease in the internal energy of the air present inside the tyre. This decrease of internal energy leads to fall in temperature of the inside air. Hence, the air coming out is cooler than that of the surrounding. When we heat an object, it expands. Is work done by the object in this process? Is heat given to the object equal to the increase in its internal energy? When we heat an object, it expands, i.e. its volume increases. ∆W has some non-zero positive value. Thus, heat given to the object is not equal to the increase in the internal energy of the system. When we stir a liquid vigorously, it becomes warm. Is it a reversible process? When we stir a liquid vigorously, we do work on it due to which its temperature rises and it becomes warm. To bring back the liquid to the initial temperature, heat needs to be extracted from it. But it is an irreversible process that cannot be brought back to the initial state by stirring the liquid again in the opposite direction. What should be the condition for the efficiency of a Carnot engine to be equal to 1? η=1, W=Q1 or Q2=0, the total heat which is abstracted from the source gets converted into work. When an object cools down, heat is withdrawn from it. Does the entropy of the object decrease in this process? If yes, is it a violation of the second law of thermodynamics stated in terms of increase in entropy? When an object cools down, heat is withdrawn from it. Hence, the entropy of the object decreases. But the decrease in entropy leads to the transfer of energy to the surrounding. The second law is not violated here, which states that entropy of the universe always increases as the net entropy increases. Heat is a form of energy. Since the first law of thermodynamics deals with the conservation of heat, it actually refers to the conservation of energy in the broader sense. The first law of thermodynamics is just the restatement of the law of conservation of energy. We observe that the energy supplied to a system will contribute to change in its internal energy and the amount of work done by the system on its surroundings. (d) the said process is not possible. U=∫CvdTHere, Cv is the specific heat at constant volume and dT is the change in temperature. If the process is isothermal, i.e. dT = 0, dU = 0. ΔW is the positive work done by the gas. (a) âˆ†Q1 > âˆ†Q2 (b) âˆ†Q1 = âˆ†Q2 (c) âˆ†Q1 < âˆ†Q2 (d) âˆ†Q1 ≤ âˆ†Q2. Both the processes A and B have common initial and final points. So, change in internal energy, âˆ†U is same in both the cases. Internal energy is a state function that does not depend on the path followed. In the P-V diagram, the area under the curve represents the work done on the system, âˆ†W. Since area under curve A > area under curve B, âˆ†Wâ€‹1> âˆ†W2. Here, âˆ†Q1 and âˆ†Q2 denote the heat given to the system in processes A and B, respectively. (d) first decreases then increases. dV = change in volume. Since dV is positive, i.e. the volume is continuously increasing, work done by the system also continuously increases. (A) If heat is added to a system, its temperature must increase. (B) If positive work is done by a system in a thermodynamic process, its volume must increase. If heat is added to a system in an isothermal process, then there’ll be no change in the temperature. (d) cannot be obtained from this information. ∆V = change in volume. Consider two processes on a system as shown in figure. The volumes in the initial states are the same in the two processes and the volumes in the final states are also the same. Let âˆ†W1 and âˆ†W2 be the work done by the system in the processes A and B respectively. (d) Nothing can be said about the relation between âˆ†W1 and âˆ†W2. (d) increases or decreases depending on the nature of the gas. As the piston of a metallic cylinder containing gas is moved to compress the gas, the volume in which the gas is contained reduces, leading to increase in pressure and temperature. When the time elapses, the heat generated radiates through the metallic cylinder as metals are good conductors of heat. Consequently, the pressure of the gas in the cylinder decreases because of decrease in the temperature. The pressure p and volume V of an ideal gas both increase in a process. (a) Such a process is not possible. (b) The work done by the system is positive. (c) The temperature of the system must increase. (d) Heat supplied to the gas is equal to the change in internal energy. ∆V be the change in volume of the ideal gasâ€‹. Since in this process the volume is continuously increasing, the work done by the system will be positive. 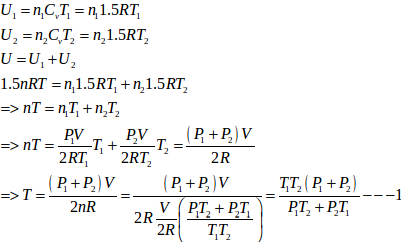 Since both p and V are increasing, temperature (T ) must also increase. In a process on a system, the initial pressure and volume are equal to the final pressure and volume. (a) The initial temperature must be equal to the final temperature. (b) The initial internal energy must be equal to the final internal energy. (c) The net heat given to the system in the process must be zero. (d) The net work done by the system in the process must be zero. P1V1T1=P2V2T2⇒T1=T2 P1=P2 and V1=V2b) Internal energy is given by ΔU = nCvΔT. Since ΔT = 0, ΔU = 0.
c) This may not be true because the system may be isothermal and in between, heat may have been given to the system. Also, the system may have done mechanical expansion work and returned back to its original state. d) Not necessary because an isothermal system may have done work absorbing heat from outside and coming back to the same state losing heat. A system can be taken from the initial state p1, V1 to the final state p2, V2 by two different methods. Let âˆ†Q and âˆ†W represent the heat given to the system and the work done by the system. 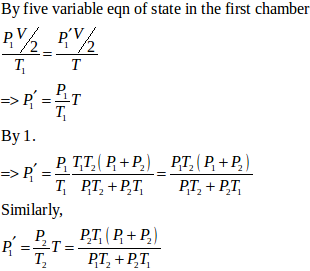 Which of the following must be the same in both the methods? (a) âˆ†Q (b) âˆ†W (c) âˆ†Q + âˆ†W (d) âˆ†Q − âˆ†W. â€‹A system is taken from an initial state to the final state by two different methods. So, work done and heat supplied in both the cases will be different as they depend on the path followed. On the other hand, internal energy of the system (U) is a state function, i.e. it only depends on the final and initial state of the process. They are the same in the above two methods. ΔW is the work done by the system. Refer to figure. Let âˆ†U1 and âˆ†U2 be the change in internal energy in processes A and B respectively, âˆ†Q be the net heat given to the system in process A + B and âˆ†W be the net work done by the system in the process A + B. (a) âˆ†U1 + âˆ†U2 = 0. (b) âˆ†U1 − âˆ†U2 = 0. (c) âˆ†Q − âˆ†W = 0. The process that takes place through A and returns back to the same state through B is cyclic. Being a state function, net change in internal energy, âˆ†U will be zero, i.e. ⇒ΔU=ΔU1+ΔU2=0Here, âˆ†U is the total change in internal energy in the cyclic process. ΔQ-ΔW=ΔUHere, âˆ†Q is the net heat given to the system in process A + B and âˆ†W is the net work done by the system in the process A + B. The internal energy of an ideal gas decreases by the same amount as the work done by the system. (a) The process must be adiabatic. (b) The process must be isothermal. (c) The process must be isobaric. (d) The temperature must decrease. ΔQ=ΔW+ΔU⇒ΔQ=0 ∵ ΔW=-ΔUThus, no heat is exchanged in the process, i.e. the process is adiabatic and since the internal energy is decreasing, the temperature must decrease because the gas is an ideal gas. On the other hand, volume and pressure of the gas are varying, leading to positive work done. So, the process cannot be isochoric and isobaric. A thermally insulated, closed copper vessel contains water at 15°C. When the vessel is shaken vigorously for 15 minutes, the temperature rises to 17°C. The mass of the vessel is 100 g and that of the water is 200 g. The specific heat capacities of copper and water are 420 J kg−1 K−1 and 4200 J kg−1 K−1 respectively. Neglect any thermal expansion. (a) How much heat is transferred to the liquid-vessel system? (b) How much work has been done on this system? 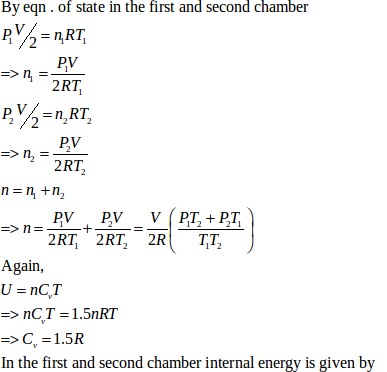 (c) How much is the increase in internal energy of the system? The system comprises of an insulated copper vessel that contains water. (a) Since the system is insulated from the surroundings, no heat is transferred between the system and the surroundings. This implies that the heat transferred to the liquid vessel system is zero. The internal heat is shared between the vessel and water. dQ=dW+dUHere, dW=pdVWork is done by the system. Thus, work done is negative. Figure shows a paddle wheel coupled to a mass of 12 kg through fixed frictionless pulleys. The paddle is immersed in a liquid of heat capacity 4200 J K−1 kept in an adiabatic container. Consider a time interval in which the 12 kg block falls slowly through 70 cm. (a) How much heat is given to the liquid? (b) How much work is done on the liquid? (c) Calculate the rise in the temperature of the liquid neglecting the heat capacity of the container and the paddle. (a) Heat is not given to the liquid; instead, the mechanical work done is converted to heat. Also the container is adiabatic. So, no heat can enter or exit the system. This implies that the heat given to the liquid is zero. (b) Since the 12 kg mass falls through a distance of 70 cm under gravity, energy is lost by this mass. As this mass is connected to the paddle wheel, energy lost by this mass is gained by the paddle wheel. (c) Suppose âˆ†t is the rise in temperature of the paddle wheel when the system gains energy. A 100 kg lock is started with a speed of 2.0 m s−1 on a long, rough belt kept fixed in a horizontal position. The coefficient of kinetic friction between the block and the belt is 0.20. 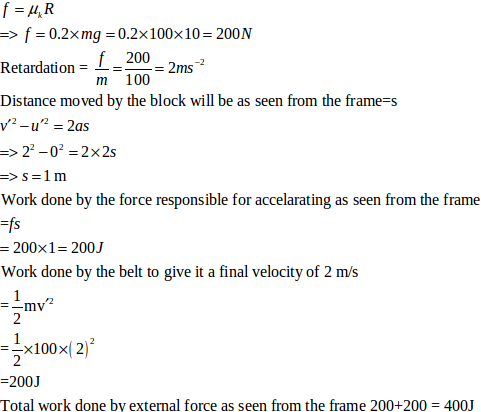 (a) Calculate the change in the internal energy of the block-belt system as the block comes to a stop on the belt. (b) Consider the situation from a frame of reference moving at 2.0 m s−1 along the initial velocity of the block. As seen from this frame, the block is gently put on a moving belt and in due time the block starts moving with the belt at 2.0 m s−1. calculate the increase in the kinetic energy of the block as it stops slipping past the belt. (c) Find the work done in this frame by the external force holding the belt. Calculate the change in internal energy of a gas kept in a rigid container when 100 J of heat is supplied to it. We see that heat supplied to the system is used up in raising the internal energy of the system. The pressure of a gas changes linearly with volume from 10 kPa, 200 cc to 50 kPa, 50 cc. (a) Calculate the work done by the gas. (b) If no heat is supplied or extracted from the gas, what is the change in the internal energy of the gas? Since pressure is also changing, we take the average of the given two pressures. 30×103×50-200×10-6=-4.5 J(ii) Since no heat is supplied to the system, âˆ†Q = 0. An ideal gas is taken from an initial state i to a final state f in such a way that the ratio of the pressure to the absolute temperature remains constant. What will be the work done by the gas? Figure shows three paths through which a gas can be taken from the state A to the state B. Calculate the work done by the gas in each of the three paths. P∆VIf both pressure and volume are changing during a process, then work done can be found out by finding the area under the PV diagram. Since both pressure and volume are changing, we use the mean pressure to find the work done. Initial volume in path ADB, along line DB is the same as final volume. Thus, work done along this line is zero. When a system is taken through the process abc shown in figure, 80 J of heat is absorbed by the system and 30 J of work is done by it. If the system does 10 J of work during the process adc, how much heat flows into it during the process? Initial point is a and the final point is c.
As internal energy is a state function so it depends only on the initial and final points and not on the path followed by the system. This implies that change in internal energy for path abc and path adc is the same. Here, âˆ†Q is the amount of heat absorbed and âˆ†U is the change in internal energy of the system. Also, âˆ†W is the work done by the system. 50 cal of heat should be supplied to take a system from the state A to the state B through the path ACB as shown in figure. Find the quantity of heat to be suppled to take it from A to B via ADB. Since initial and final volumes are the same along the line BC, change in volume of the system along BC is zero. Hence, work done along this line will be zero. Volume changes from 200 cc to 400 cc. In path ADB, âˆ†Q = ? Work done for line AD will also be zero. 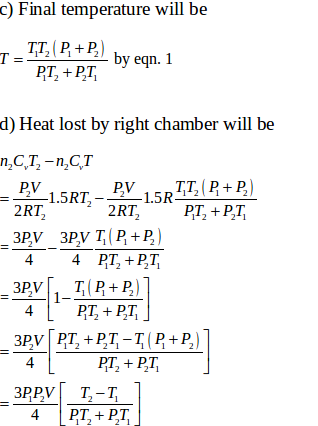 Calculate the heat absorbed by a system in going through the cyclic process shown in figure. ∆Q=∆U+∆WSince internal energy depends only on the initial and final points and for a cyclic process, initial and final points are the same, change in internal energy of the system during this process will be zero. A gas is taken through a cyclic process ABCA as shown in figure. If 2.4 cal of heat is given in the process, what is the value of J ? A substance is taken through the process abc as shown in figure. If the internal energy of the substance increases by 5000 J and a heat of 2625 cal is given to the system, calculate the value of J. A gas is taken along the path AB as shown in figure. If 70 cal of heat is extracted from the gas in the process, calculate the change in the internal energy of the system. Given: 70 cal of heat is extracted from the system. Here, negative sign is taken because the final volume is less than the initial volume. Here, negative sign indicates that heat is extracted out from the system. The internal energy of a gas is given by U = 1.5 pV. It expands from 100 cm3 to 200 cm3 against a constant pressure of 1.0 × 105 Pa. Calculate the heat absorbed by the gas in the process. Let change in volume of the gas be âˆ†V. Thus, heat absorbed by the system is 25 J. A gas is enclosed in a cylindrical vessel fitted with a frictionless piston. The gas is slowly heated for some time. During the process, 10 J of heat is supplied and the piston is found to move out 10 cm. Find the increase in the internal energy of the gas. The area of cross section of the cylinder = 4 cm2 and the atmospheric pressure = 100 kPa. Here, positive sign indicates that the internal energy of the system has increased. A gas is initially at a pressure of 100 kPa and its volume is 2.0 m3. Its pressure is kept constant and the volume is changed from 2.0 m3 to 2.5 m3. Its Volume is now kept constant and the pressure is increased from 100 kPa to 200 kPa. The gas is brought back to its initial state, the pressure varying linearly with its volume. (a) Whether the heat is supplied to or extracted from the gas in the complete cycle? (b) How much heat was supplied or extracted? If volume is kept constant for line BC, then âˆ†V = 0. When the system comes back to the initial point A from C, work done is equal to area under line AC. From the graph, we see that the area under AC is greater than the area under AB. We also see that heat is extracted from the system as change in the internal energy is zero. Consider the cyclic process ABCA, shown in figure, performed on a sample of 2.0 mol of an ideal gas. A total of 1200 J of heat is withdrawn from the sample in the process. Find the work done by the gas during the part BC. Since the change in volume of the system applies on line CA, work done during CA will be zero. Figure shows the variation in the internal energy U with the volume V of 2.0 mol of an ideal gas in a cyclic process abcda. The temperatures of the gas at b and c are 500 K and 300 K respectively. Calculate the heat absorbed by the gas during the process. Thus, work done for paths da and bc is zero. Since the process is cyclic, âˆ†U is equal to zero. Since the temperature is kept constant during lines ab and cd, these are isothermal expansions. Find the change in the internal energy of 2 kg of water as it is heated from 0°C to 4°C. The specific heat capacity of water is 4200 J kg−1 K−1 and its densities at 0°C and 4°C are 999.9 kg m−3 and 1000 kg m−3 respectively. Atmospheric pressure = 105 Pa.
Let change in internal energy be âˆ†U. Calculate the increase in the internal energy of 10 g of water when it is heated from 0°C to 100°C and converted into steam at 100 kPa. The density of steam = 0.6 kg m−3. Specific heat capacity of water = 4200 J kg−1 °C−1 and the latent heat of vaporization of water = 2.25 × 10 6J kg−1. Figure shows a cylindrical tube of volume V with adiabatic walls containing an ideal gas. The internal energy of this ideal gas is given by 1.5 nRT. The tube is divided into two equal parts by a fixed diathermic wall. Initially, the pressure and the temperature are p1, T1 on the left and p2, T2 on the right. The system is left for sufficient time so that the temperature becomes equal on the two sides. (a) How much work has been done by the gas on the left part? (b) Find the final pressures on the two sides. (c) Find the final equilibrium temperature. (d) How much heat has flown from the gas on the right to the gas on the left? Let n1 , U1 and n2 ,U2 be the no. of moles , internal energy of ideal gas in the left chamber and right chamber respectively. b) Let final pressure in the first and second compartment P1’ and P2’. An adiabatic vessel of total volume V is divided into two equal parts by a conducting separator. The separator is fixed in this position. The part on the left contains one mole of an ideal gas (U = 1.5 nRT) and the part on the right contains two moles of the same gas. Initially, the pressure on each side is p. The system is left for sufficient time so that a steady state is reached. Find (a) the work done by the gas in the left part during the process, (b) the temperature on the two sides in the beginning, (c) the final common temperature reached by the gases, (d) the heat given to the gas in the right part and (e) the increase in the internal energy of the gas in the left part. (a) Since the conducting wall is fixed, the work done by the gas on the left part during the process is zero because the change in volume will be zero due to the fixed position of the wall. Let the initial pressure on both sides of the wall be p.
Let initial temperature be T1. Let the initial temperature be T2. Let T1 and T2 be the initial temperatures of the left and right chamber respectively.